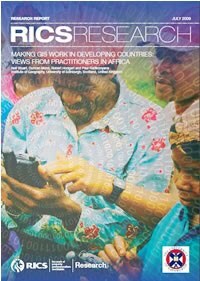 A survey of 18 African countries, published by the RICS in 2009, found that the serious constraints to Making GIS Work in Developing Countries were (i) lack of support for GIS from their senior managers and decision makers, (ii) the lack of awareness from these people of the benefits that GIS could provide and (iii) the lack of personnel with appropriate skills and training. The lack of data was also identified as a serious or very serious hindrance. IMHO this seems to be the case with the Caribbean as well. The Coastal Zone of every Caribbean country from Bermuda to Suriname (an interesting geography question) and most Latin American ones is an important economic area. Many countries are of course particularly concerned about the effect of possible sea level rise due to Climate Change on their economic activity and their very survival. The Caribbean Marine Atlas (CMA) Pilot Project began as a joint initiative of 9 countries in the Caribbean region including Barbados, Cuba, Dominica, Grenada, Guyana, Jamaica, Saint Lucia, Trinidad and Tobago, and Turks and Caicos Islands. 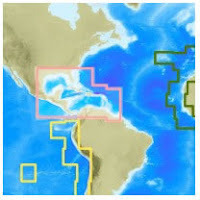 The purpose of the CMA is to identify, collect and organize available geo-spatial datasets into an atlas of environmental themes for the Caribbean region as a support service to the sustainable development and integrated management of marine and coastal areas in the region. Clearly, this would serve the Caribbean well. UNESCO's International Oceanographic Commission (IOC) has made available IOC Workshop Report No. 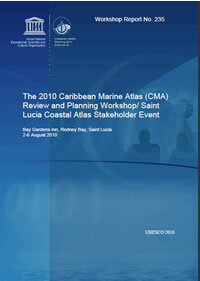 235, containing the reports of the 2010 CMA Review and Planning Workshop and the Saint Lucia Coastal Atlas Stakeholders Event. The effort began in 2007, and one impression from the report is that it seems to be stumbling into the low wall of data - overlooked by higher decision-makers and those in charge of budgets and policies, but a wall to progress nonetheless - that characterises the Caribbean. A comparison between the Oregon Coastal Atlas and the CMA reveals the distance between the two efforts. Whilst the comparison may seem unfair, I do so to contrast the two data environments and their effect, and to ask the CMA and higher national and regional decision-makers whether the citizens of the Caribbean will ever truly have and benefit from the intended decision support tool? 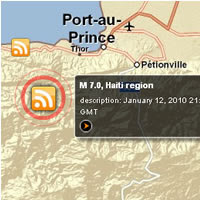 The recent Oct 2010 International Conference on Crisis Mapping (ICCM2010) was devoted to assessing the experiences of the 2010 Haiti Earthquake response. Presentations from this conference are now online as 5-6 minute videos - note that this link is not permanent to these videos. 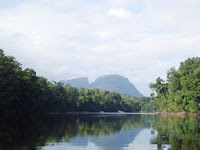 A project by Edinburgh University, Royal Botanic Garden Edinburgh, the University of Belize, Belize Botanic Gardens, Programme for Belize and other institutions is completing a Map of Savannah Ecosystems in Belize. 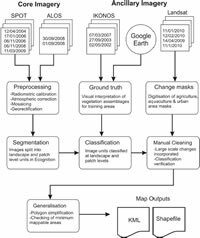 The team combined SPOT and ALOS PALSAR data together in a Definiens workflow and also utilised IKONOS and LandSat imagery. Field checking is still ongoing and the final revision is expected out in Mar 2011, but the 1st and 2nd links mentioned above provide details of the work and results. 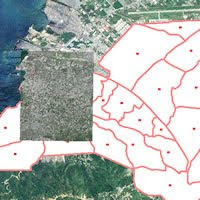 The project is also building up local capacity in GIS in Belize, and a variety of resources should also become available for GI professionals to access in the coming year. This project follows one by the EEO in 2008 estimating carbon sequestration using radar imagery. It bears repeating that these EEO projects and those by CATHALAC on mangroves and forests are going to provide a Belleza body of current, quantitative work on remote sensing in the neotropics. Thanks Neil Stuart. 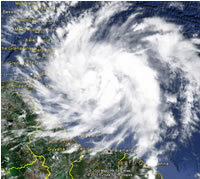 It seems that Saint Lucia has set about getting broken infrastructure and other problems caused by Hurricane Tomas fixed. But I'm sure they could still use any assistance that can be offered - so contact the Saint Lucia NEMO and get maps of the situation on the MapAction website. 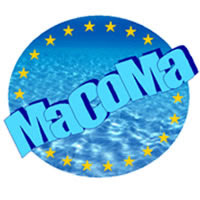 The Call for Applications for the Erasmus Mundus PhD in Marine and Coastal Management 2011-2014 edition has been announced. The deadline is 01 December 2010. Thanks GSDI. Lots of trouble in the neighbourhood at the moment - Tomas has whacked Barbados, St. Vincent & the Grenadines and Saint Lucia and is potentially taking aim at Jamaica, Haiti, Dominican Republic, Cuba and the Bahamas. 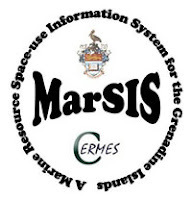 However, here's a small reminder that tomorrow is the last day to get a registration discount for the URISA 2010 Caribbean GIS Conference scheduled for Dec 6-10 in Trinidad. Whilst Tropical Storm Shary aims towards Bermuda, at the other end of the Caribbean we're looking in amazement (and with some amount of concern for ourselves and los amigos in Venezuela and Trinidad) at the potential formation of another off the coast of the Guianas. 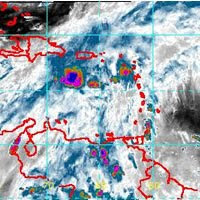 The Caribbean is about 90% water, so today on Blog Action Day 2010, I'm pointing attention towards the discussion about Water. It's important. Even in the Land of Many Waters where I live, (that's the translation of the name in English), this issue needs attention. 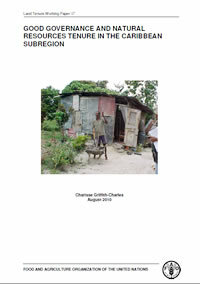 The FAO Working Paper Good Governance and Natural Resources Tenure in the Caribbean (Aug 2010) by Dr. Charisse Griffith-Charles of UWI's Faculty of Engineering discusses this issue which affects all Caribbean nations and citizens. 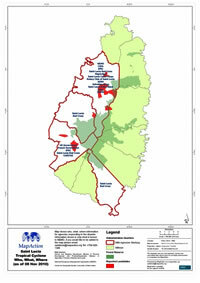 Dr. Griffith points out that 'land governance policy in the Caribbean is currently conflicted between internally led pro-poor programmes such as housing provision and lax land tax and squatting enforcement on the one hand, and externally initiated economic directives from international banks such as advice to divest state held lands and to improve land tax recovery on the other'. Overall it seems that few success stories in good governance practice were found, with the exception of Saint Lucia. Though brief (30 pages) the Paper alerts us to the fact that issues such as crime and violence, corruption and national governance are interlinked with land governance. Can land administration/governance be a barometer of good national governance itself? The author also advocates for family land tenure and that 'communal and participatory mechanisms can be used to distribute the efforts and capacities required for sound management of land' - though pointing out that this may be contrary to modern administration. Thanks Peter Rabley. 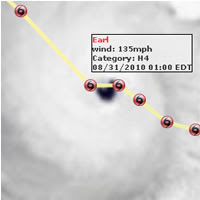 A year ago I mentioned the excellent visualisation provided by MSNBC's Hurricane Tracker. Here's another: IbisEye, which seems to have been built by the Sarasota (USA FL) Herald Tribune newspaper. Nice presentation and good use of current GOES imagery. Of course there's also the Weather layer in Google Earth 5.2 which also provides a realistic presentation. These online tools synthesizing current and available data don't take away the role of your normal weather service; but with the first Category 4 hurricane (Earl) of the Atlantic season underway and another storm(s) (Fiona) formed/forming they are quick and informative ways to stay informed. Thanks N. Woof. The deadline for submission of abstracts for the URISA 5th Caribbean GIS Conference has been extended to Mon 23 August 2010. 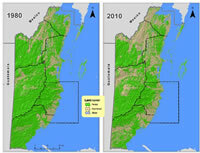 CATHALAC and NASA in collaboration with the Ministry of Natural Resources and the Environment of Belize have completed a remote sensing-based assessment of deforestation and forest cover dynamics of Belize (1.26MB PDF). The study has been validated, and covers 1980 through 2010 (it includes mapping of 1980, 1989, 1994, 2000, 2004, and 2010). The abovementioned technical paper provides pretty detailed instructions on how to go about doing such a study, and the source and the output data as well as the spectral signatures generated and used in this study are also available. 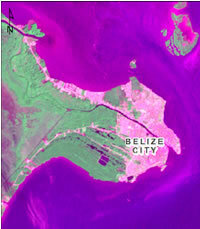 Theoretically, if the forests of other parts of the Caribbean reflect light in similar ways to Belize's forests, the self-same spectral signatures can be used for mapping elsewhere in the Caribbean, for instance. CATHALAC intends to continue collaboration with Belize's Ministry of Natural Resources and the Environment (specifically specialists at the Land Information Centre and the Forest Department), to catalyze regular, sustained space-based monitoring of Belize's forests. CATHALAC also hopes that the technical paper stimulates the interest of other folks in the Caribbean to pick up something like this - they show that the barriers to conducting such studies are small. Thanks E. Cherrington. Update: (Thanks K. Lance) Based on this analysis of Landsat satellite imagery for 1980, 1989, 1994, 2000, 2004, and 2010, the validated, national-level assessment indicates that Belize's forest cover has declined from 75.9% in 1980 to 62.7%. Average annual deforestation was estimated at 0.6%, equaling the clearing of some 24,835 acres (9,982 hectares) of forest per year. An UNDAC Team member is trying to find out more about the best methodologies for the capture and use of geodata in an emergency scenario. His survey - a single page of 22 multiple-choice type questions - is easy to do and will help UNDAC help others. It's low-resolution (1-4km) imagery from an old sensor with an ageing propulsion system, but nonetheless, according to the US National Oceanic & Atmospheric Administration (NOAA), weather forecasters in South America should now be able to get 'more imagery and data to track dangerous storms – including tropical cyclones – and the storms that can trigger potentially deadly mudslides'. This is because NOAA has shifted the GOES-12 satellite to a geostationary orbit at 60 degrees West longitude - a position over Brasil and a tad south of Guyana - to cover South America. 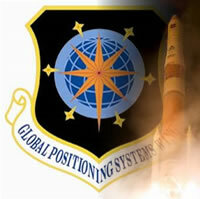 It became operational on May 10, 2010. 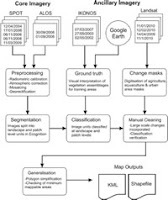 For those more interested in the other end of the remote sensing spectrum, resolution-wise, see this previous post. NGOs of the World Unite! NGOs, put yourselves on the map. Or at least put yourselves on a map. Have a look at this great idea by the National Geographic Society (NGS) - Global Action Atlas. It's a website showing the locations and profiles of projects managed by nonprofits around the world in the areas of conservation, humanitarian affairs, cultural preservation, climate change, exploration, and energy. Frank Biasi of the NGS says that it's being built 'to give the nonprofit community a rich platform to promote their work and attract supporters, and to use National Geographic's brand and reach to engage a large audience of inspired individuals to take action'. I also think that because this facility is open and accessible to all, it will serve a useful purpose when one needs to reach able organisations in an emergency such as a natural disaster. For instance, we can all still remember the confusion and the need to reach organisations through which assistance could be channeled in the days and weeks following the Jan 2010 earthquake and the Sep 2008 flood in Haiti. By the way, only three of the 300 or more projects that I know exist in Haiti are represented, so far. This beta release does seem to choke once in a while as it loads VirtualEarth and other components along with its own data, but come on Caribbean NGOs, get yourself listed. Today, Ordnance Survey opened free access to some of its data. The 1:50,000 and better vector and raster data may be downloaded at your convenience via OS's OpenData portal. This is quite a departure from the OS's well known charge-for-everything approach to one that is more civilian-centered. Will the OS see a drop in revenue from this move? Yes. Will the UK gain invention and better services for society and a more varied and resilient economy when these data are put to use by more brains than the OS or the UK government can afford to pay for? I think, yes! (The way we all benefited when this Brit invented the World Wide Web). What will the National Mapping Agencies (NMAs) in this Region think of this, I wonder. Many, in the Anglophone parts, follow in the 100-year old footsteps of a UK institution, and are very protective of their data. Will the heads of these agencies or their governments change their policies likewise now? When they do, one benefit will be better disaster-preparedness in that country. I.e. It will be easier to plan and deliver humanitarian assistance to citizens in the aftermath of natural disasters. The Nippon Foundation of Japan has provided funding for the General Bathymetric Chart of the Oceans (GEBCO) to train a new generation of scientists and hydrographers in ocean bathymetry. The 12-month course, leading to a Postgraduate Certificate in Ocean Bathymetry (PCOB), has been held at the University of New Hampshire, USA, since 2004. GEBCO produces bathymetric charts and digital grids of the world ocean by collating, interpreting and contouring, with the aid of directional fabrics revealed by satellite gravity, single and multibeam soundings collected by surface ships, submarines and other underwater vehicles. Students for the PCOB will be selected by a competitive application process. Minimum qualifications for acceptance are a four year undergraduate degree in a related science or engineering discipline, and proof of ability to successfully complete graduate level courses conducted in English. The selection process will aim at choosing candidates from a wide geographic distribution of coastal countries. There's certainly room for more knowledge and understanding about this vast area of the Region. The positions are fully funded and the Caribbean Sea is apparently an area of interest for GEBCO. The closing date for applications is 22 March 2010. Calling all Coastal Zones! The University of the Azores has launched the 1st International Summer School on Geotechnologies Applied to Marine Spatial Planning (MSP) - GIslands 2010. The course is a 6-day exercise (7-12 August 2010) in the Azores with resource persons in MSP, Integrated Coastal Zone Management (ICZM), GIS, Remote Sensing, Environmental Modelling and Spatial Data Infrastructure (SDI). The course is free but applicants are subject to evaluation and must cover their own costs. Application deadline: 4 April 2010. It's probably obvious from previous posts that I think Open Source software provides an interesting avenue for the Region to develop its information systems and that even commercial GIS software companies should consider porting their excellent packages to run on Open Source systems. Today, the owners of Symbian, which powers hundreds of millions of devices around the world (e.g. many Nokia phones) announced that their software is now Open Source. By doing so Symbian is now tapping into creative energy and development talent from around the globe. With the dire situation in Haiti there's a lot of spatial data including hi-resolution satellite imagery and from-the-ground vector data being generated to support the emergency humanitarian effort. The ESRI GEOSS/ GEO Viewer mentioned in the previous post is doing a great job of updating what it offers and providing an integrated view from the flood of data. It's a little slow, but I understand that it's had to make the leap from demonstration prototype to operational resource in a hurry; so full credit to the people behind it for doing so. 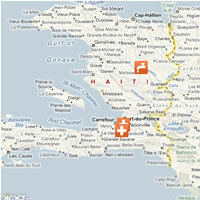 The scale of the humanitarian crisis caused by the earthquake in Haiti is now beginning to be understood. One source of information is the new GEOSS Viewer. Its use of up-to-date data, via RSS feeds, and its smooth interface makes it an excellent visualisation tool for both GIS Specialists and wider users such as the news media. It is a website that allows for the search of data across multiple data portals and has analytical capabilities, such as population estimations. It is currently focused on the disaster area of Haiti. 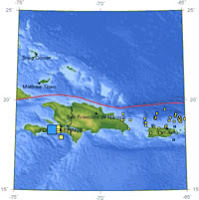 There is a GeoRSS feed that will show the locations of the earthquakes there – from the USGS Earthquake data. The site is being enhanced with additional data and imagery to support humanitarian response operations. 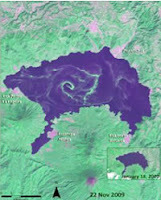 The site is built using the ArcGIS Server API for Flex Sample Viewer, which is a free API for non-commercial use – which any organization can download and use from here: http://resources.esri.com/arcgisserver/apis/flex/. Additional widgets are available from the code gallery here: http://resources.esri.com/arcgisserver/apis/flex/index.cfm?fa=codeGallery. Thanks to Carmelle Terborgh for the details.